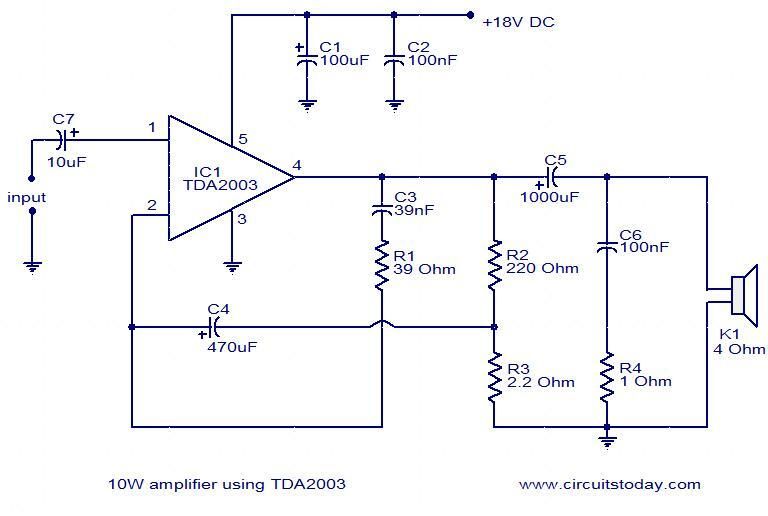 Here is the circuit diagram of a 10W audio amplifier using the popular TDA2003 IC from SGS Thomson. The IC can easily deliver 10W to a 4 Ohms load at 18V DC supply voltage. The IC can be also operated from 12V and that makes it applicable in car audio systems. The useful features of TDA2003 include short circuit protection between all pins, thermal overload protection, low harmonic distortion, low cross over distortion etc. The circuit given here is designed as per the datasheet from the manufacturer and found to be working fine. Capacitor C7 performs the job of input DC decoupling.R2 and R3 is used to set the gain of the amplifier.C3 and R1 determines the upper cut off frequency.C6 and R4 and meant for increasing stability at high frequencies. Capacitor C5 couples the output to the speaker. It is better to use a PCB for assembling this circuit. PCB layout for this circuit can be found on the datasheet of TDA2003. Use 18V DC for powering this circuit. Input ground and output ground must be properly decoupled. Speaker K1 can be a 4 ohm one. TDA2003 must be fitted with a heat sink. Hi Rex you can use 33nF with 47 ohms or 47nF with 33 ohms. which are standard components. Hi Rex being a single supply amplifier (without plus and minus) one has to use a tone control or pre amplifier with single supply only. The passive two transistor tone control with 12 volt supply, appeared in our earlier project will suit this the best. Seetharaman, what Class does this amplifeir belong? Seetharaman, give us the “BRIDGE AMPLIFEIR CIRCUIT” using two of this IC, TDA2003 as bridge amplifeir to get One output. WOW! Your circuit works great. It works perfectly but I have a problem on how to control it’s volume. So, can you please add a potentiometer? What is the voltage rating of all the capacitors? Hi Sugiman use TDA2822M a 8pin IC the best choice for your requirement. it is stereo can work down to 1.8 volts and maximum up to 15volts. at the real. i just want to build a mini music box like music angel. which the feature are, with 3.7v LiIon batt use nokia charger, 2 spk, power amp 2×3 watt st, play mp3 from MicroSD or USB flashdisc, and including a fm radio. the question, how can i build it with lower cost money? if Music Angel cost rate Rp 150.000, i want the ceaper then. thanks for help. Hi Sugiman the recommended operating voltage for 10watts power into 2 ohms speaker is 14.4volt DC. A minimum of 8volts is the amplifiers requirement. Use 3nos 4 volt 1 amp batteries in series as the power supply with 2200uF as decoupling capacitor. with 4 ohms speaker the output power will be around 5watts. you can use a dual cone elliptical speaker with a power handling capacity of 6watts at 4 ohms.